The MSP includes four parts: the explanatory note; strategic sections; justification and description of permitted use of the sea; and the graphical section. Additionally during the process of MSP the following documents were prepared: environment report; suggestions for assessment of implementation effectiveness of the planning proposal; and report on stakeholder involvement and public hearing. The MSP has been established in accordance with the Spatial Development Planning Law (in force since 1st December, 2011). The law defines that the MSP shall lay down the use of the sea, considering a terrestrial part that is functionally interlinked with the sea and co-ordinating the interests of different sectors and local governments in the use of the sea. The MSP has also been elaborated according to Regulation No. 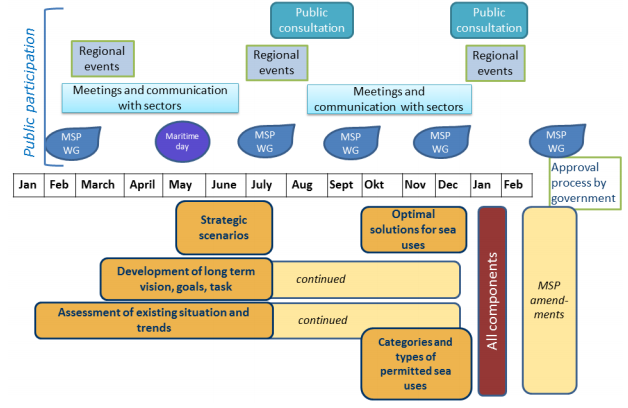 740 of the Cabinet of Ministers on the Procedures for the Development, Implementation and Monitoring of the Maritime Spatial Plan (in force since 30th October, 2012). According to Regulation No. 740 of the Cabinet of Ministers, MSP is developed for the whole part of the Baltic Sea under the jurisdiction of the Republic of Latvia. Rational and balanced use of the sea space by eliminating inter-sectoral conflicts and preserving free space for future needs and opportunities. The development of the Latvian MSP is in accordance to HELCOM-VASAB Guideline for the implementation of ecosystem-based approach in MSP. 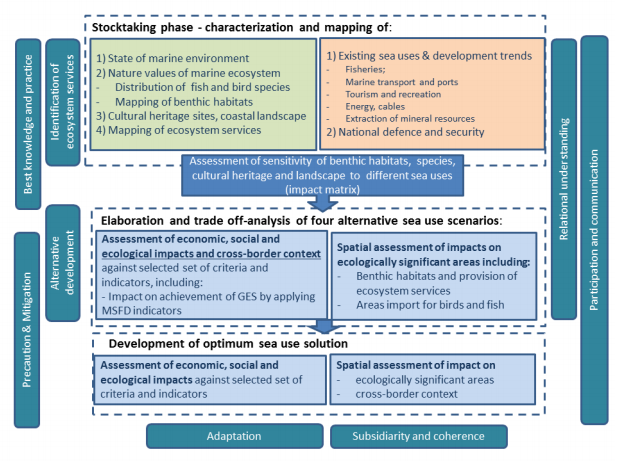 This approach was applied within all steps of MSP development, by assessing the possible negative impacts to nature assets and ecologically significant areas and thus avoiding as much as possible the negative impacts to marine ecosystem. The plan includes the Internal Waters, Territorial Waters and Exclusive Economic Zone of the Republic of Latvia. 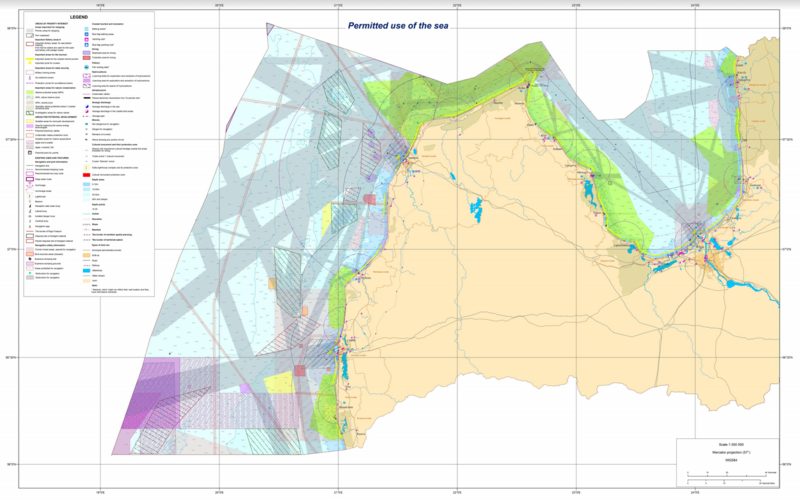 The borders of MSP are set according to the signed international agreements and hydrographically defined boundaries used by the Maritime Administration. 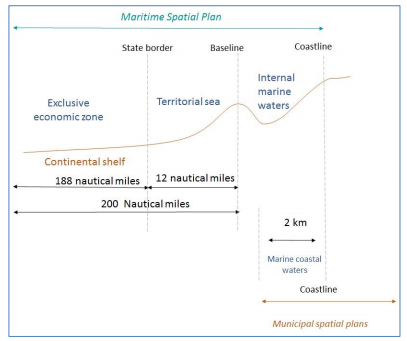 The criteria for defining permitted use of the sea includes conditions, that should be taken into account,when allocating space for the particular use of the sea and setting limitations for other uses, in order to avoid conflicts between the sea uses sectors, to ensure compliance with the regulatory framework, nature conditions and availability of resources, as well as to minimise the negative impact on marine ecosystem. Setting a part spatially incompatible sea uses. Areas of general use, where all sea uses are allowed, including fishery, shipping, tourism and leisure, research, etc., as long as they are in line with exiting legal requirements and not causing significant negative impact to marine environment. Besides the MSP text itself, a map has been created for the permitted use of the sea. The categories (Priority, Potential Development, Other types or AReas of general use) determine the Conditions and requirements for planning decisions (such as permits, regulation etc). An overview of these conditions and requirement per use can be found in the MSP document on page 36-41. Stakeholder involvement is a core issue within the MSP process. Almost 400 stakeholders have been identified and contacted. These key stakeholders represent all sectors relevant to the use of the sea and planning levels. Latvia is a member of the Joint HELCOM-VASAB Maritime Spatial Planning Working Group. The legal procedure for transboundary consultation is laid down in the legislation on SEA. Therefore a notification letter issued by the Environment State Bureau (under MoEPRD) was sent to the competent authorities of Estonia, Sweden and Lithuania on March 27, 2015. Cross-border consultation meetings were followed with Estonian and Lithuanian in July 2015 and January 2016. Ministry of the Environmental Protection and Regional Development of Latvia is taking part in the DG Environment Project “BALTIC SCOPE – Towards coherence and crossborder solutions in Baltic Sea Maritime Spatial Plans”. In the frame of the project transboundary cooperation on particular spatial planning issues will be fostered with Estonia and Sweden.